Soligo made in France 1925 green and black beauty. Great preowned condition. 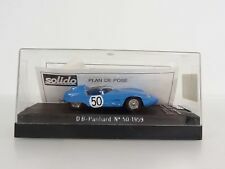 Solido Retro Le Mans Series. Die Cast Car. 1:43 Scale (I think?). This lot appears new, but I listed it as used because the case has a few marks and I'm not sure if there was an outer box. 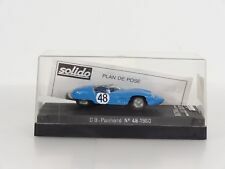 3.5 INCH DB Panhard le Mans 1959 Solido 1/43 Diecast Used Loose 4 Restauration? 1/43 Solido. Panhard 1925,without plastic cover. Front doors open. All detail in perfect condition. 1/ Scale Model by SOLIDO. Model is in EXCELLENT condition - Showing slight signs of wear/aging Box is in EXCELLENT condition - Worn. Our aim is to ensure no matter what the model, we will provide an excellent service experience. 1/ Scale Model by SOLIDO. Model is in EXCELLENT condition - Showing slight signs of wear/aging -Insecure in box. Our aim is to ensure no matter what the model, we will provide an excellent service experience. 1/ Scale Model by SOLIDO. Model is in EXCELLENT condition - Showing slight signs of wear/aging, Slight marks to paintwork. Our aim is to ensure no matter what the model, we will provide an excellent service experience. 1/ Scale Model by SOLIDO. Model is in EXCELLENT condition - Showing slight signs of wear/aging. Our aim is to ensure no matter what the model, we will provide an excellent service experience. Ending Soon. 1/ Scale Model by SOLIDO. Model is in EXCELLENT condition - Showing slight signs of wear/aging. Box is in POOR condition - Worn. Our aim is to ensure no matter what the model, we will provide an excellent service experience. 1/ Scale Model by SOLIDO. Our aim is to ensure no matter what the model, we will provide an excellent service experience. Ending Soon. New Arrivals. The RM Toys Team. Kind Regards. MINT - The item is in perfect condition.